A gallery or venue can be any location where your art is physically located. It could include art galleries, museums, or even a coffee house where you are displaying your work. You should also set your studio up as one of your venues. All work stored in your studio should be assigned to the studio. 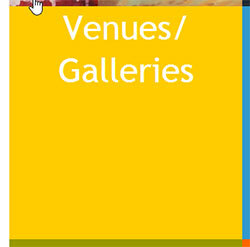 To add a new gallery or venue, click on the "Galleries" link in the top menu, or use the "Galleries/Venues" block from your account home screen. In the add a venue page, click on the "add" button to create a new venue. Enter all of the contact information for the gallery on the next screen and click the "save" button. The new gallery will now appear on your list of galleries. Please note that this list of galleries is what populates your drop-down menus on your art page, and on your consignment lists. If you need to remove a gallery from these lists, clicking on the "remove " button next to the gallery name will remove it from these lists, but will not change the location of any artwork assigned to the gallery that has been removed. You can restore galleries that have been removed from this list by using the drop-down menu (which will show you every gallery you have ever added to ARTsala) and clicking on the "Add This Venue to Your List of Venues" button.